The analysis of large-scale simulation data from virtual populations can be effective to gain computational insight into disease mechanisms and treatment strategies, which can serve for generating hypotheses for and focusing subsequent clinical trials. This can be instrumental in shortening the critical path in medical product development and more cost-effective clinical trials. 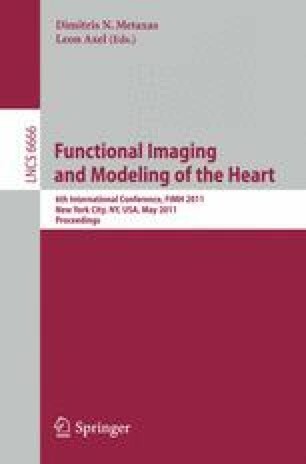 A previously published pipeline established point correspondence among volumetric meshes to enable meaningful statistics on cardiac electrophysiological simulations on the anatomical distribution of a large-scale virtual population. Thin Plate Splines (TPS), derived from surface deformations, were used to warp a template volumetric mesh, removing the costly operation of repeated volumetric meshing from the pipeline, but potentially at the cost of the volumetric mesh quality. In this work we compare (1) the influence of using TPS versus volumetric meshing of deformed surface meshes, and (2) the influence of surface mesh subsampling prior to the TPS computation. Our results suggest that warping of a template volumetric mesh introduces errors in electrophysiological simulation results of around 4 ms, while having computational times per mesh on the order of seconds, at surface subsampling rates of up to 80%.